Ultracold atomic systems can be used to model condensed-matter physics, providing precise control of system variables often not achievable in real materials. This involves inducing charge-neutral particles to behave as if they were charged particles in a magnetic field. 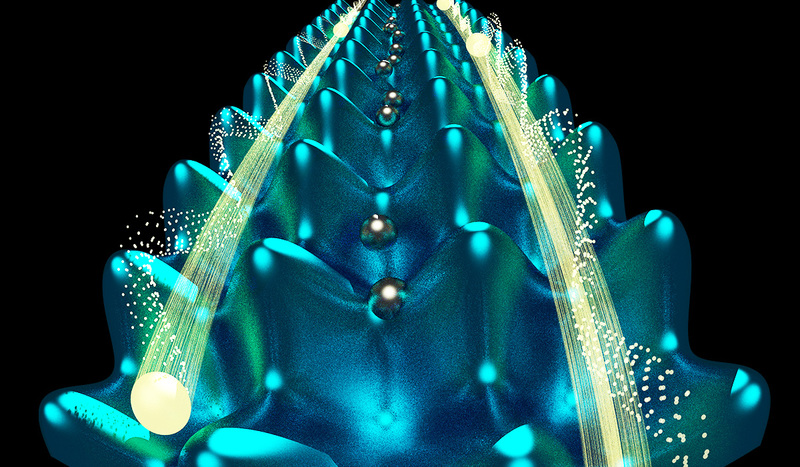 To this end, PFC-supported researchers have replicated the signature “edge state” behavior of real electrons in the quantum Hall effect (QHE) with neutral atoms in an optical lattice. To do so, the scientists created a Bose-Einstein condensate of a few hundred thousand rubidium atoms and used two intersecting lasers to arrange the atoms into a lattice pattern. A second pair of lasers, each set to a slightly different wavelength, was trained on the lattice. Depending on the tuning of these laser beams, the atoms were placed in one of three different quantum states representing electrons that were either in the middle of, or at opposite edges of, the two-dimensional lattice. By adjusting the properties of the laser beams, the team created "artificial magnetism", producing dynamics characteristic of real materials exhibiting the QHE. Specifically, as would be expected of electrons, atoms in the bulk interior of the lattice behaved like insulators. But those at the lattice edges exhibited a distinctive "skipping" motion, producing localized edge states. The researchers could further modify the artificial magnetic field to precisely control whether the largest concentration of atoms was on one edge, the opposite edge, or in the center of the lattice. This dynamical effects are only achievable in the "high-field" limit of the artificial field, surpassing previous work demonstrating weak artificial magnetic fields. Working near this limit greatly expands the possibilities for engineering new kinds of interactions relevant to condensed-matter physics.